You wish to create unique blinds and curtains? Thanks to our upholstery fabrics and curtains accessories and supplies, you will be able to create amazing pieces. Pick our curtain rings, metal hooks, and wood rings. Select our tension curtain rods, tassel, and tie backs. Find a great collection of shower curtain rod, plastic rings, shower rings, or pole. Purchase our curtain clip rings and eyelet tape. Find decorative curtain ring, and more are at your online fabric store. Tired of refurbishing sofas, bedding, stools and dining chairs? Stitch new Valances, bath curtain or made to measure curtains. Do you wish to refresh your old hanging curtains? Would you like to makeover your bathroom shower curtain? Find the best upholstery fabrics, poles, and ring set at Ma Petite Mercerie, and start your project. Discover a wide range of drapery hooks to install your homemade shower curtains, valance, blinds and further. 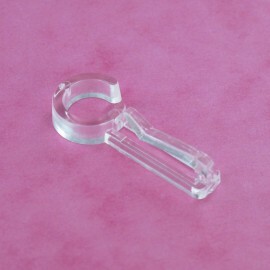 Pick plastic curtain hooks for your shower curtains. Use these plastic hooks as shower curtain rings or shower curtain hooks. Purchase our curtain hook one by one! Plus, you can add a bit of decoration to your home, with our curtains tiebacks selection. Are you looking for a particular tool? Please email us and we will try our best to find what you are looking for. You want your rugs, doors, bathroom, sinks, tile, ceiling and curved shower to match your drapery and curtain liner? Look at the goods we have in store! Choose from our wide selection of polyester fabric, blackout fabric and create unique window drapery and pinch pleat curtains. Among our curtain hardware and curtain accessories, find our bronze brushed grommet! However, you can pick our shower curtain clips, and install your own accent metal curtain. Cover doors, bathroom shower and window dressings with our functional novelty voile and curtain drapery. In order to do it, install your curtain poles above the window you wish to hide. Then, attach your canvas with eyelet curtain hooks. Once you finished installing your curtain drapery, add cute details with our pinch curtain clip, metal rings, ties, and tassels.